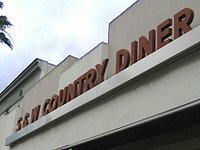 Ever since before I even started working in the area, I was mildly perplexed by S&W Country Diner and Double Dutch Dinette in downtown Culver City. I never came across something like this example of the exact opposite of the Hotelling Model in Econ 100A nor in my more “advanced” studies of business. Did S and W miss out on the whole location, location, location chapter of the Product Placement textbook? Maybe the Dinette got whapped up side the head a little too hard with the jump rope when they were off on recess instead of paying attention in Competitive Strategy class. The two restaurants, both diners, are right next to each other. Not in the same city, not in the same neighborhood, not on the same street, and not even on the same block. They are next door neighbors. If the two diners were owned by the same person, perhaps they could take advantage of economies of scale and share the kitchen, but I am pretty sure that they are independently and separately owned and do not share a kitchen. Like other great business mysteries of the world including the Microsoft Empire and Martha Stewart, it baffled my mind. I don’t know which restaurant was there first, but I just could not figure out why the other would open up right next to it. *shakes head* Were they really no other vacant spots in all of Culver City?! But after finally eating at both places, I realized that all my bewilderment was for nothing. Though one is called a “diner” and the other “dinette” they are wholly unlike each other. Though S&W’s name is spelled out in simple reddish brown block letters that could almost be mistaken for sleek, one step through the wood-framed screen door and you’ll definitely know it’s a country diner. The front room has the diner’s counter, a few tables, and the hostess’ stand. When we walk in, the gal in low-rise jeans and wife-beater tank top half-running for quick service, half-running to balance the tray without spilling, smiles back over her shoulder as she passes us into the second dining room and promises that she’ll be right with us. When she comes, she adds us to a clipboarded list that looks like a 15 minute wait for us. We stepoutside with the mix of business cazh, firemen, truckers, and trendsters. I have no idea where the trendsters came from. We scoot into a red-vinyl booth in the second dining room that’s decked out in full country technicolor decor with enough vintage Coca-Cola and other down-home, farmstand knick knacks tacked on the walls that would make your Aunt Betty’s garage sale proud. Some of the tables are covered with country-floral tablecloths and others are bare, exposing sunshine yellow formica tops. I have no problem propping my elbows up on the table while scanning the overwhelming menu of home-style diner foods, about half of which is breakfast. “Build-a-Breakfast” starts with almost twenty permutations of eggs and meat that ranges from the usual bacon, sausage, and Spam (! ), to meatloaf, pork chops, and for the trendster yogis, a garden burger. The “build” on top of that comes in two parts. One choice can be pancakes, waffles, French toast, and of course the very country biscuits with gravy. The second choice comes from a whole list of additional sides, two of which are fruit and cottage cheese. I wonder if people choose cottage cheese after ordering meatloaf with their eggs. LOL! The rest of the menu is sandwiches that start at PB&J and grilled cheese, through various deli and fancier chicken sandwiches, then up to burgers. There’s a whole section dedicated to “Melts,” but it looks like the regular sandwich list with a few cents added to the price. There are a few other things on the menu like fried chicken, soups, salads, and Mexican food. Mexican food. I don’t know why that’s funny to me, but it is. The food at S&W is nothing extraordinary. My Caesar salad was made with iceberg lettuce that was slightly brown around the edges, but I guess that sort of adds to the country home cooking charm. The best thing on his full country breakfast plate was the corned beef hash, which was the reason he chose to come to S&W for lunch in the first place. Before we even sat down, he had asked if they still had it (otherwise we’ll go next door, was his whisper to me when she went back to the kitchen to check). Apparently, the corned beef hash is deliciously popular, and they can run out of it by 11 a.m. They were making a fresh batch. I could totally feel his *phew* of relief. 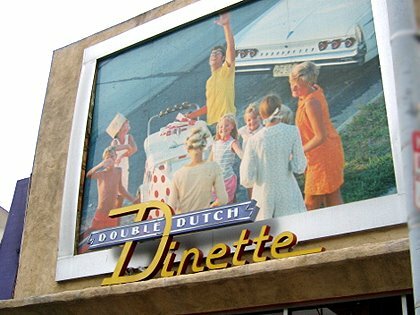 Double Dutch Dinette is right next door to S&W Diner, but it’s not a diner. It’s a dinette, which I always thought was a table and chairs for under a bill at Ikea, but according to my inside sources, a dinette is also “a small space usually off a kitchen used for informal dining.” It’s a pretty accurate description of Double Dutch. There’s a large mural of a happy family behind their old-school tuna boat of a car, so it’s definitely retro, but to what time period, I have no idea. I tend to lump everything before the 1980s all together. LOL! ossed together is my current favorite. The Exotic chicken is one that I’ve eaten many many times, but let’s not get into how I feel about apricots, feta cheese and walnuts being “exotic.” LOL! Double Dutch has sandwiches, a few hot entrees, and strictly vegetarian dishes as well, some of them dinette-y like a BLT and turkey meatloaf, and some of them not as dinette-y, like baked polenta and raspberry salmon, which is the most expensive thing on the menu at $13. The dinner menu is almost identical, only a few dollars more expensive for each item. Both restaurants serve good food, and though both are likely catering to local downtown Culver City businesses and the big studio clientele for daytime meals, they are different. I am guessing that S&W gets a lot of entertainment meetings in the early hours before yoga, and a lot of entertainment meetings that are technically breakfast for those of us who wake up that late. Double Dutch serves good lunch, but it also looks like they do quite a bit of business in catering. So though they may not have been awake during the lecture on the Hotelling phenomenon, S&W and Double Dutch definitely did their homework about product differentiation.